Have you been to a job interview recently, perfectly qualified for the job, answered all the questions well but still found yourself rejected? Well, the answer could lie in your body language! Recent studies suggest that only 7% of your communication are the actual words you say, 38% are certain vocal elements like your intonation but 55% is your nonverbal. Things like your facial expression, your gestures and your posture. 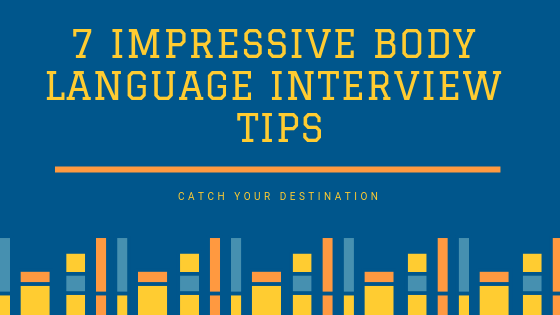 So this article can look at the messages you’ve been sending out with your body language in the interview and how these body language interview tips can help you to tweak those to make sure you’re sending out all the right signals at your next interview. So, think about your body posture! A very natural thing for people to do is to slouch in the chair or fold their arms. This looks like you’re making yourself smaller wrapping yourself up and the signal you’re giving off to the interviewer is that you’re defensible nervous. Instead, open up your body, don’t cross your legs or fold your arms. Engage slightly forward from the waist and this will give the appearance to the interviewer that you’re interested. If you are giggling about a lot in the chair, keeping changing your body posture or you’re playing with a button on your shirt or the ring or other objects, you’re going to appear anxious and nervous and certainly, the interview is going to be less inclined to have confidence in you. so, a really good tip is to first slow your breathing down, this will slow your heart rate and make you feel less nervous! Keep your hand gestures steady and use only to emphasize a point. Touching your heart signifies that what you’re saying is genuine. Clasping your hands is a sign of self-comfort and anxiety, so make sure you avoid it. Mirroring the interviewer is an effective technique but it needs to be done very subtly. Mirroring hand movements or positive gestures, waiting ten seconds though before you do it yourself. you can also mirror your speech – So their vocabulary, their jargon, the rate of volume of their speech. People trust those that are similar to themselves. So this makes the interviewer and feels at ease and you’re more likely to build rapport with them. For the panel interviews, make sure you look at everybody but specifically focus your attention on the person who is asking you the question or is speaking at the time. To avoid lying signals, the main rule is to avoid touching your face so especially your nose, your mouth, your ears and your sideburns. These are all signs that will suggest to your interviewer that you’ve been dishonest with the way that you’re answering their questions. So the handshake is an obvious one but so many people get this wrong. it’s the unspoken word that initiates conversation in any social or professional get-together. to0 firm and you’ll seem too dominant and to0 weak you’ll seem underconfidence. Instead always initiate the handshake, match the interviewer’s grip apply the one two-second rule smile and repeat their name. By putting these body language tips into practice you’ll be giving off the right impression at your next interview. Now all you need to worry about is what you’re actually going to say. If you enjoyed reading this article please comment below! Hi @goapti team :- Please add more such articles it will be very helpful for us to crack the interviews. Sure Sekhar! You can visit our Blog section https://goapti.in/category/blog/ for few more article. We will keep you informed with new such articles. Awesome….A great article and worth reading! 2019 goapti.in All rights reserved.